Not quite four score and seven years ago, I was an elementary school student, staring at a classroom map, gripped by the (mistaken) deduction that since Los Angeles was in the southern half of the country, Civil War battles must have clattered on the ground outside my home. While a teacher eventually helped me understand that California wasn’t in the Confederacy, the moment led me to understand the weight of history and that it has shaped the world into what it is today. 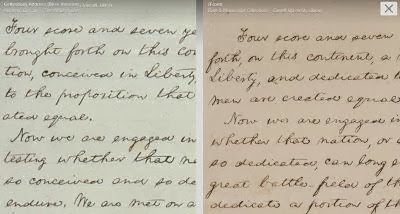 You can also contribute your own version of the Gettysburg Address to Learn the Address, a project by documentarian Ken Burns, who has also been reaching schoolchildren across the U.S. with Google+ Connected Classrooms. Most of us will never stand in the Lincoln Bedroom and see the handwritten draft exhibited there. But now anyone with access to an Internet connection can explore all these artifacts from this defining moment in history—perhaps a bit more accurately than when I gazed at that map. This entry was posted on Monday, November 18, 2013 at 9:00 PM and is filed under Cultural Institute. You can follow any responses to this entry through the RSS 2.0. You can leave a response.